Rydych chi yma : Hafan / Mid-Wales Constabulary. 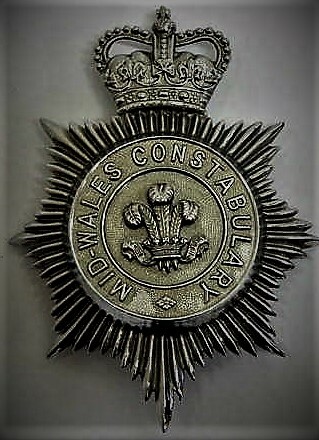 A helmet plate of the former Mid-Wales Constabulary. A Home Office police force for the counties of Brecknockshire, Radnorshire and Montgomeryshire between 1948 and 1968. The force was created on the 1st April 1948 by the amalgamation of Brecknockshire Constabulary, Radnorshire Constabulary and Montgomeryshire Constabulary under sections 3 and 4 of the Police Act of 1946. The Headquarters were in Newtown. The force was abolished in 1968, when it was amalgamated with Carmarthenshire and Cardiganshire Constabulary and Pembrokeshire Constabulary to form the Dyfed-Powys Constabulary. In 1965, the Mid-Wales force had an establishment of 225 officers but an actual strength of 220. The Ross Mather Police Memorabilia of Wales Collection.